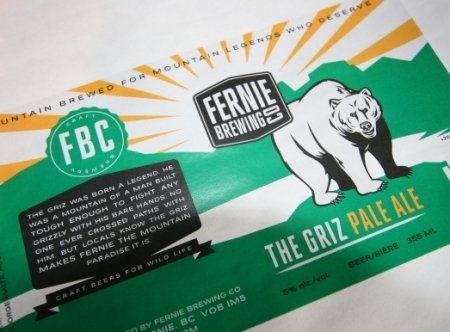 FERNIE, BC – Following on last year’s packaging redesigns for several Fernie Brewing brands including Buck Wild Ale and First Trax Brown Ale, the brewery has revealed a revamped look for its popular The Griz Pale Ale. As shown in the photo above, the new cans feature striking green and gold graphics along with a distinctive grizzly bear image, and text describing the legend of The Griz, “a mountain of a man built tough enough to fight any grizzly with his bare hands”. New cans of The Griz Pale Ale will be arriving in stores in early February.